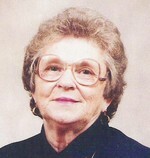 Mrs. Lela Mae Josey Clarke, 89, passed away on Sunday, Nov. 29, 2009, at Bermuda Commons Assisted Living in Advance, N.C.
She was born Feb. 12, 1920, in Pulaski County, Va., to the late John Lee and Ethel Thomas Josey. Mrs. Clarke was married to the late Scotty Clarke and retired from Beauty Maid. She loved to sew and cook for family and friends and also wrote a cookbook. Mrs. Clarke is survived by two grandchildren, Jonathan Waddell and Kenny Clark; four great-grandchildren, Luke and Zoe Clark, and Jonas and Josiane Waddell; two brothers, Mack and Tommy Josey; and two sisters, Barbara Turner and Vivian Cooke. In addition to her husband and parents, she was preceded in death by a son, Johnny Clarke; a sister, Katherine Mullins; and five brothers, Dave, J.D., George, Ralph and Troy Josey. A visitation will be held from 6 to 7 p.m. on Thursday, Dec. 3, 2009, at Troutman Funeral Home with a memorial service immediately following. The Rev. David Troutman will officiate. The family wishes to express sincere appreciation to Mrs. Clarke’s caregiver, Virginia Benge, for the loving care she gave Mrs. Clarke.